[Toronto, ON] - [April 20th, 2018] At 2pm on Friday, April 20th, SmartPrint team members James Dunn, Rob Farrell, Steven Ryan, Carolyn Allum, Jen Infuso, Andrew Thompson, Trisha Kosak, Andres Matute, Ishan Shah participated again in a Corporate 20-Minute Makeover which was a cleanup run in conjunction with the CleanToronto Together - the City's annual spring cleanup. James Dunn at SmartPrint put the team of people together that were able to get away from the office to volunteer and help clean up a local park. Steven Ryan, Client Services Manager helped run the campaign and was the photographer of the day. Carolyn Allum, Accounts Payable Clerk organized lunch at our office for the team, and for those that weren't able to participate, before we headed out. being collected, such as baseballs, cans, pop cans, plastic bags, plastic bottles, coffee cups, coffee lids, glass bottles, polystyrene, and other items. Given that it was the same spot that we did the cleanup last year we were all disappointed that such a large amount of items had accumulated over the year. At the end of the 20 minutes, 10 recycling bags and 3 trash bags were filled. 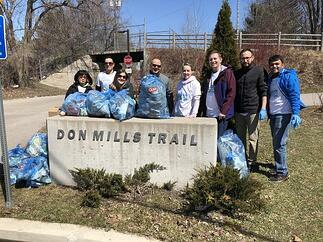 "I was really happy to join the team for the cleanup this year because I had to miss the event last year. 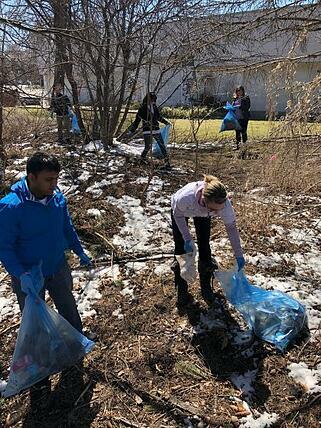 It was fun to get out as a team and clean things up in our community, and I was surprised with how much trash there was and how quickly we filled up 13 bags!" At the end of the 20 minutes, everyone including Andres and Ishan who had recently joined SmartPrint was amazed at how much was collected and look forward to participating again, and to contributing to other social responsibility causes in the future.